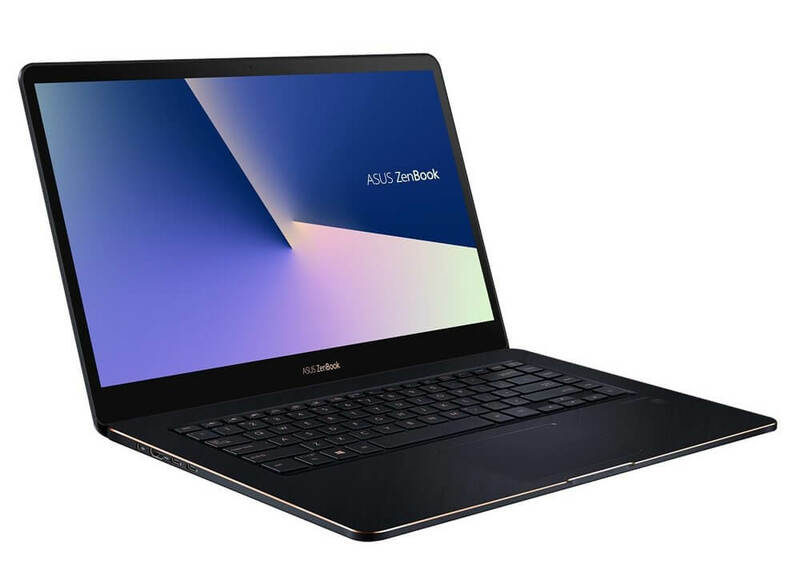 Asus has refreshed its ZenBook Pro 15 laptop to make it thinner and more power than ever before. The addition of 8th Generation Intel Core processors, improved screen to body ratio, and three heat pipe design keeps it running smoothly with excellent visuals. The biggest change is the availability of an Intel Core i9 processor in this year's ZenBook Pro 15 UX550GD. Processor options include an i5-8300H up to 4.0GHz, i7-8750H up to 4.1GHz, and i9-8950HK up to 4.5GHz with 8, 9, and 12MB of cache respectively. All three CPUs are hexa-core models. All configurations come with a GeForce GTX 1050 with 4GB GDDR5 VRAM. However, it would have been nice to see at least a GTX 1060 considering the display options. The base unit comes with a 1920x1080 panel that covers the entire sRGB color gamut. A 7.3mm bezel around the sides of the screen allow for an 83 percent screen-to-body ratio. A touch screen of the same resolution is available or the display can be upgraded to a 4K UHD panel that has even better color calibration and is a touch screen by default. Currently, the ZenBook Pro is listed with a VGA webcam. This is a shortcoming of an otherwise premium model. While certainly not a deal breaker, it is an oddity that a portable professional oriented laptop does not have modern communication hardware. Storage is completely solid state on the ZenBook Pro 15. A 256GB or 512GB Sata 3 SSD and a 512GB or 1TB PCIe SSD can be chosen. I/O is plentiful with two USB Type-C 3.1 Gen 2 ports supporting Thunderbolt, two standard USB 3.1 Gen 2 Type-A ports, an HDMI out, a 3.5mm TRRS combination audio jack, and a MicroSD card reader. Standard connectivity includes dual-band 802.11ac Wi-Fi and Bluetooth 5.0. A 71Wh 8-cell lithium-polymer battery provides up to 9 hours of battery life. Although it maight take some aggressive power saving features to achieve the full runtime, Asus states that it takes precisely 49 minutes to recharge from zero to 60 percent using the 150W power adapter with barrel plug. Pricing and availability is still unknown, although previous models give a good indication. Units are likely to be available around June and will be upwards of $1,500 and breaking $2,000 for fully loaded configurations.